If you’ve ever wanted to be someone you’re not or wanted to do things you think you can’t do, usually, you make up big beautiful stories in your head, to help you, to get you by, or just to take yourself away for just awhile. In Silhouette Stages latest offering, Big Fish, with Book by John August and Music & Lyrics by Andrew Lippa, Directed by TJ Lukacsina, with Music Direction by Michael Tan, and Choreography by Rikki Lacewell – this is exactly the case. This 2013 Broadway musical adaptation of a 1998 novel by Daniel Wallace and 2003 film of the same name. Don’t be put off by this being an adaption. You don’t need to know the Big Fish movie or novel to get this show and still enjoy it. I think I saw the movie once, but can’t remember anything besides the name. I hadn’t realized a book existed until I Googled it, but that didn’t matter. John August and Andrew Lippa did their job so well that you don’t need to be familiar with the source material. 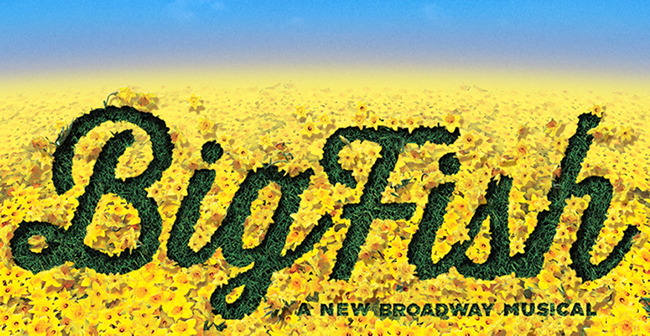 Briefly, Big Fish concerns itself with Edward Bloom, who is a dying old man who tells improbable self-aggrandizing comical stories to his son, Will Bloom. Will finds this habit aggravating as his is a reporter interested in the historic truth and what actually happened. He responds to his father’s fatal diagnosis by digging into his father’s past, looking for historic truth amid the lies. He eventually discovers his dad has anti-skeletons in his closet including the fact he helped his neighbors rebuild after a flood. This leads him to accept his dad’s use of exaggeration and story telling to avoid talking about painful subjects. This story is a good drama. You feel the conflict between father and son, the bitterness it causes, and the catharsis. Putting it on the table, I’m a brand new reviewer, trying something new. I just see a lot of shows so I figured I’d try my hand at reviewing. I don’t play an instrument, build sets, or act. I just watch lots of plays. So umm… The Set Design by Alex Porter looked cool and the live orchestra and cast sounded great. 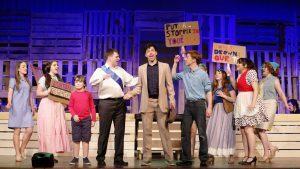 The performers sang and moved well, including Luis Montes as Edward Bloom, Michael Nugent as Will Bloom, and Emily Mudd as Sandra Bloom, the little dysfunctional family. Nothing broke, the lights came on when they were supposed to, so, when all is said and done, the production value is top notch, but I love theater for the story telling, so I’ll focus on that. Big Fish balances between being funny and being serious and, in the process, it tells a story about the power and purpose of the stories people tell about themselves. As the story of Big Fish progresses, Will finds a series of stories Edward tells about himself. 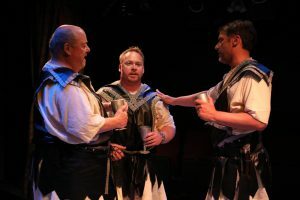 These are exaggerated tall tales are funny, nonsensical, and increasingly fictional and are presented to the audience in scenes and musical numbers. For instance, Edward says he learns of his demise from a Witch (Emily Alvarado), takes up with a giant named Karl (Nick Rose), learns how to swim from a mermaid (Emily Mahovec), discovers his circus boss, Amos (Richard Greenslit) is a werewolf, and gets shot out of a cannon, among other situations. These stories are good comedy. They’re feel good, funny, and well delivered and they blend in smoothly with the frame story’s heavier material. For its conclusion, Big Fish ties the stories together and, finally, Will discovers the truth. His father is hiding a disappointed former sweetheart, Jenny Hill (Christa Kronser). He makes peace with his father’s casual approach to historic fact. We assume the tall tales are false. Then Karl the Giant shows up at the funeral. So what if anything was true? Big Fish asks, “Who cares what the actual truth is?” Big Fish asks. The now enlightened Will embraces exaggeration, tall tales, and myth as modes of communication. The historic truth is no longer the only truth he cares about. Edward Bloom has a reckless disregard for historic facts. He tells so many tall tales that maybe he doesn’t know or remember the “real truth”. He definitely doesn’t care and he just tells the story that matters to him. His son, a reporter, finds this infuriating. When Edward gets his fatal diagnosis, Will’s investigative reporting leads him to a witness, Jenny Hill, Edward’s allegedly jilted high school sweetheart. Jenny tells Will about how awesome his lying father really is. Well… does Jenny tell the son the historic truth? Her story sounds like fake news. Did Edward really buy his high school sweetheart a house to sooth her broken heart? Oh, come on! Will suspects an affair and that sounds way more probable than the Jenny’s version. She even suggests she doesn’t want to ruin Will’s image of his father before telling him a transparent whopper. But Will accepts the tall-tale about how his dad magically moved a town without anyone posting it on the internet (Will’s smartphone actually gets used a few times as a prop and he’s got Google installed). Why? Because Will realizes that the lies let everyone get along better. He could confront his dying father and his grieving mother with the affair. But why? The truth will make everyone miserable, not free. So he says nothing and humors his dying father, like a normal well-adjusted human. The story then shows us that Edward Bloom really had a very big friend named Karl. Fact and fiction have blended and the audience can no longer tell the true story from the tall tales, or fact from fiction. In the final scene, we see the reporter son has abandoned his dream of teaching his son to crave and search for truth and instead embraces telling tall tales to keep people happy. That’s #2018 for you. Now, Silhouette Stages and TJ Lukacsina didn’t go there and, considering the production’s superb, I’ll write that down as a good call! But you can see this darker story peaking out over the wooden stage fencing around the live orchestra’s box on stage. 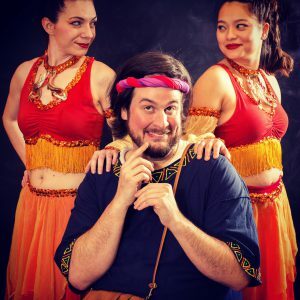 Regardless of how you see this story, if you’re familiar with it or not, Silhouette Stages has put together an entertaining, well produced production that shouldn’t be missed this season! You won’t be disappointed! 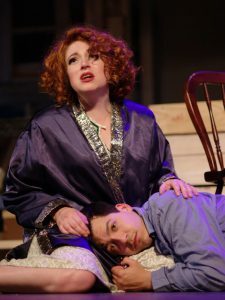 Big Fish will run through May 27 at Silhouette Stages, Slayton House, 10400 Cross Fox Lane, Columbia, MD. For tickets, call 410-637-5289 or purchase them online. Fairy tales are probably some of the best fodder for stage adaptations because, after all, they’re entire stories that are already written and told. It’s up to the author and, if a musical, the lyricist and composer of that stage adaptation to put the story together with a script and songs. 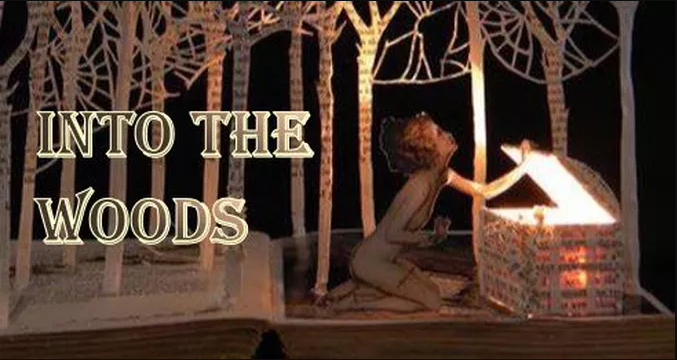 In the case of Heritage Players latest offering, Into the Woods with Music & Lyrics by Stephen Sondheim and Book by James Lapine, Directed by TJ Lukacsina, with Music Direction by Chris Pinder and Choreography by Rikki Howie does something refreshingly different. By intertwining a bunch of different stories into one big story, we get a delightful, interesting spin on what happens in the life of these popular characters outside of the stories we all know and love. Briefly, Into the Woods gathers together the title characters of Cinderella, Little Red Riding Hood, Jack and the Beanstalk, Rapunzel, and a few other popular tales and throws them together in a story of trying to our happy-ever-after in life, regardless of what it throws at you, and learning that life, in fact, is not a fairy tale. Through aspects of each story, we learn a little more about these characters and realize all is not always what it seems. Set Design by Ryan Geiger, though simple, is fitting and quite effective. The unit set is good for different settings with a simple opening of a swinging panel and small props and set pieces. For a complex show like this, this set design is well-thought out and doesn’t hinder the action, but helps by not getting in the way. Kudos to Geiger for an inspiring design. 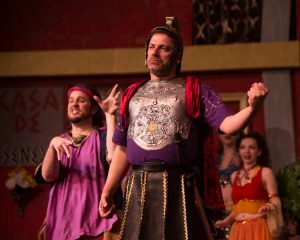 Andrew Malone, an established Costume Designer in the area, reveals his able talents in this production. Every character is fitted appropriately to character but unique enough that no one is the traditional image we know from the stories. 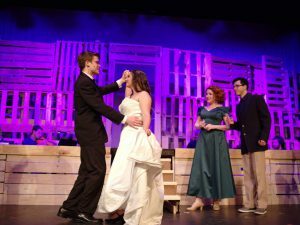 This piece gives the costumer a chance to be fanciful as well as elegant and Malone hit the nail on the head in this production. Sound Design by Brent Tomchick and Lighting Design by TJ Lukacsina had some issues, but overall, the design worked for the prouduction. Whether it was a dependency on microphones or directorial neglect, there were many characters I couldn’t understand because I could not hear them. A few of the members of the ensemble didn’t project as they should and their lines were lost. Of course, the mics themselves had their own troubles of not being at the correct levels or even turned on at the correct times. Lighting Design is its own beast and can make or break a show. Now, Lukacsina’s design certainly did not break the show, but there were curious choices throughout. A favorite covering of light seems to represent some sort of light and shadows through leaves, as if in the woods, so, I get it, but it doesn’t do the ensemble any favors as most of them are lost in the shadows. It gets rather dark at times, as well. Yes, there are dark parts in this show… metaphorically, they don’t have to actually be IN the dark. Again, there were some technical issues with Sound and Lighting Design but, overall, it is suitable for this production and doesn’t take away from the story or the performance. In fact, it just might need a little tweaking or closer attention because for the most part, it works. Choreography by Rikki Howie is minimal, at best. Not because Howie is lazy but the piece itself doesn’t call for a lot of dancing. There are a few moments when the cast gathers together to do what look like jazz squares (or box steps, depending on where you came up), and hand gestures but, that’s all that is required, really. Most of the songs simply need staging and not a lot of bouncing around. Howie does her best with the material she’s given and, all in all, the choreography is delightful. The cast is comfortable and that makes them look good, which is somewhat the point. Chris Pinder tackles this piece as its Music Director and his work is to be applauded. Teaching and working on a Sondheim score is no easy feat and Pinder has succeeded. He seems to understand the music and its nuances and he has guided his cast to give a splendid performance. Not only does he have a strong ensemble, vocally, he has a phenomenal orchestra backing them up. Well-rehearsed, and spot on, the orchestra is near flawless with this score and adds great value to the production as a whole. Included in the orchestra are Chris Pinder, Conductor; David Booth, Flute; Matt Elky, Clarinet; Allyson Wessley, Horn; Kevin Shields, Trumpet; Lynn Graham, Piano; John Keister, Synthesizer; Zachary Sotelo, Percussion; Naomi Chang-Zajic and Susan Beck, Violins; David Zajic and Kyle Gilbert, Viola; Ina O’Ryan and Juliana Torres, Cello; and Joe Surkiewicz, Bass. TJ Lukacsina takes the helm of this production as its Director and, as stated, taking on any Sondheim piece is a challenge but Lukacsina, with a few minor hiccups, seems to have stepped up to the challenge. Casting is superb and his staging is concise making for a good pace and tempo for a naturally long piece with smooth, quick transitions. Overall, the piece is focused with a clear vision from Lukacsina and it moves along nicely… in Act I. Act II in this production has its problems but it’s mainly in the staging of this fast-paced script. 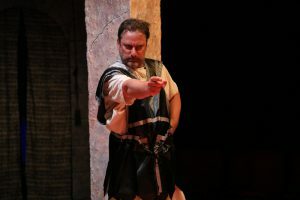 Actors seem to be coming and going haphazardly through the various entrances and exits on the stage and if one is not familiar with the piece already, it’s easy to see how one might get a little perplexed in Act II. With cleaner staging, Act II may run a bit more smoothly. Again, the hiccups are minor and, overall, Lukacsina seems to have a good comprehension of the piece and a good grasp on what the characters are about making for a well thought-out, delightful production. Moving on to the performance aspect of this piece, Todd Hochkeppel takes on the supporting role of the Narrator, the first character we encounter and Hochkeppel gives a respectable performance but, compared to the other characterizations, seems a bit over the top at times with grand, sweeping gestures that could be pulled back a bit. However, he has a great booming voice and fits well in the role. A couple of other supporting but important roles that move the piece along are the Mysterious Man played by Richard Greenslit and the Steward to the royal family, played by Sean Miller. Both Greenslit and Miller give commendable performances and make the most of the stage time they have. 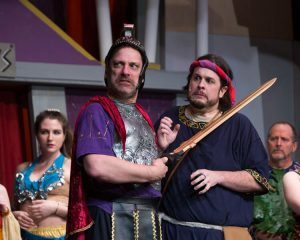 The princes, played by Josh Schoff (Rapunzel’s Prince) and John Carter (Cinderalla’s Prince), are well cast in the roles and give admirable performances but their rendition of “Agony” falls a little flat. This is one of the most well-known numbers in this piece and it’s a hilarious song. Schoff and Carter sing the song beautifully, but really just stood opposite each other and didn’t seem to capitalize on the physical humor and melodramatic presentation that makes this number so enjoyable. It’s as if they both took the roles too seriously. 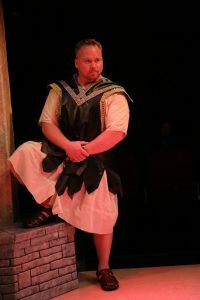 Though both give entertaining performances, the stronger of the two is John Carter whose interpretation of Cinderella’s Prince is absolutely befitting, if not a tad too soft spoken (which is a shame as his smooth, deep timber is perfect for the stage! ), and his take on The Wolf is spot on. Scott AuCoin tackles the role of the Baker, the unlikely hero of the piece and Mia Coulborne takes on the character of Red Riding Hood, the bratty little girl who has no choice but to grow up throughout the story. Both actors are confident and committed to their roles and with characters being so intricate to the plot, both carry the responsibility nicely. 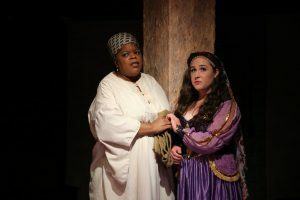 Vocally, both give superb performances as in Red Ridinghood’s number “I Know Things Now” and the Baker’s “No More” and both seem to have an easy go with the material. Their chemistry with the rest of the ensemble is believable and they give 100% to their parts. Their interpretations of the characters could use a little kick as the performances were a bit scripted and forced but, overall, they give an admirable showing. Rapunzel (played by Kirsti Dixon), the hapless girl stuck in a tower by her “mother”, who happens to be a Witch (portrayed by Rowena Winkler), are a good match to play these complex characters who play a big part in the plotline. Dixon shines with her beautiful soprano and gives an authentic portrayal as the young girl who knows there’s more out in the world than what she knows of her small tower. Winkler gives a completely dedicated, high energy performance as the Witch and her transition from Act I to Act II is more subtle than it should be both in character and presentation, but it works for the most part. Vocally, she has a better go with her higher register rather than the lower, but, overall, she gives a praiseworthy performance. Some of the most humorous bits of this production come from Cinderella’s stepmother (Traci Denhardt), and the Stepsisters Florinda (Jamie Pasquinelli) and Lucinda (Danyelle Spaar). This trio of actresses understand the importance of these characters but don’t take the roles so seriously that they’re not having fun. Pasquinelli and Spaar have a stupendous chemistry and play their characters to the hilt making for delightful performances. Denhardt as the stern Stepmother is poised and elegant, as the character requires and all three performances are on point. 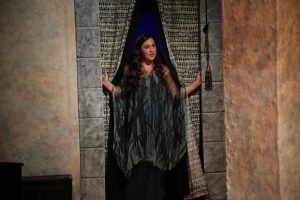 Along with this trio, Jessa Sahl takes on the role of Cinderlla’s Mother, a guiding ghost in a tree in the woods, and she gives a strong showing, especially vocally, with a clear voice that resonates throughout the theatre. Jack is portrayed by Atticus Boidy and Jacks’ Mother, played by Temple Forston are a befitting duo with a great chemistry that makes for a charming mother/son relationship. 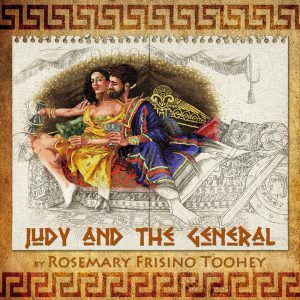 Boidy has a good grasp of his character and gives an impressive vocal performance, shining in his featured number “Giants in the Sky” while Forston is believable as the stern but loving mother who only wants what’s best for her son. She makes the role her own and, though her character’s demise could have been tweaked out a bit more, she gives a commendable, strong performance. 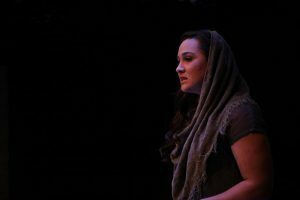 The absolute highlights of this production of Into the Woods are Sydney Phipps taking on the role of Cinderella and Alana Simone who tackles the role of The Baker’s Wife. These two powerhouses are the ones to watch. Phipps effortlessly sings through Cinderella’s numbers such as her bit in the opening of Act I and her featured number “On the Steps of the Palace.” Also, her portrayal of Cinderella is authentic and because of Phipps splendid portrayal, you feel for this girl and are rooting for her. She has a good comprehension of the character, has a good presence on stage, and gives a strong, confident performance. Likewise, Alana Simone starts off strong and keeps up the energy and consistency throughout the production. She has a booming voice and good chemistry with her fellow ensemble members, especially with Scott AuCoin, who plays her character’s husband. Simone belts out her numbers such as “It Takes Two” (with AuCoin), and the poignant “Moments in the Woods” with just the right amount of intensity and gentleness that is required of each number. Major kudos to Phipps and Simone for jobs very well done. Final thought…Into the Woods is a monumental feat for any theatre, especially community theatres. Heritage Players certainly gives it the old college try and though some aspects fall short, others absolutely thrive. 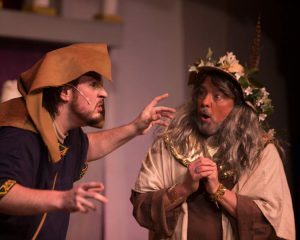 The show is long, by nature, and though this production has terrific pacing with an energetic cast, plan on sticking around for near three hours. Most of the cast is absolutely able and committed making for some great performances but as the production moves along, it seems to lose a little steam. That’s not to say it is not a commendable performance, because it most certainly is. 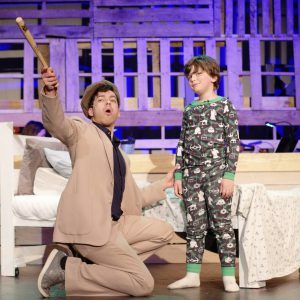 With an ensemble who works well together, a simple but effective set, an orchestra that is on point, and a few standout performances, it’s definitely worth checking out this interpretation of a Stephen Sondheim favorite. 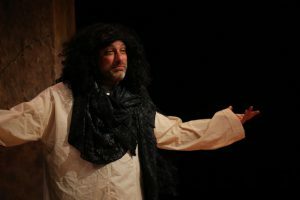 This is what I thought of Heritage Players production of Into the Woods… What did you think? Please feel free to leave a comment! 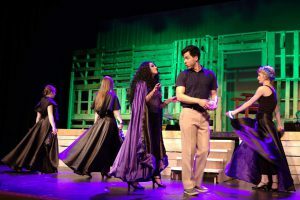 Into the Woods will run through November 19 at Heritage Players in the Thomas-Rice Auditorium on the Spring Gove Hospital Campus, Catonsville, MD. For tickets, purchase them at the door or online. It’s been repeated through the ages – being a kid isn’t easy! If you can remember (and most of us can), the world is a completely different place for a kid and Heritage Players latest offering The 25th Annual Putnam County Spelling Bee, Directed by Ryan Geiger, with Music Direction by TJ Lukacsina and Robin Trenner and Choreography by Jose Reyes Teneza, takes us right back to that crazy time when changes in body, mind, and viewpoints were happening and every day was a struggle… then the bastards throw something like a spelling bee in the mix to pit us against each other! Walking into the Rice Auditorium at Spring Grove is a treat! It’s bright, neat, and clean and it’s a space that lends itself nicely to community theatre! Ryan Geiger, who takes on double duty as Director and Set Designer uses the traditional setting (a school gymnasium) for this production and, liking traditional theatre as I do, I thought it worked very nicely. It was a minimal set but Geiger’s attention to detail is on point and large printouts of a scoreboard and sports banners are clever and give the set a neat, precise look. This is a unit set show with movable set pieces and every piece had a purpose and helped tell the story. Lighting Design by TJ Lukacsina and Sound Design by Stuart Kazanow is appropriate and sets the mood for this quirky piece. Notably, there is a very neat effect concerning the Taj Mahal that is very clever and quite effective. Sound is always a challenge for small theatres depending on the space and what the space is originally intended for. Kazanow’s Sound Design for this production is good, but seems a bit muted, slowing down the action onstage. Again, this could be because of venue and, overall, Lighting and Sound are respectable. The 25th Annual Putnam County Spelling Bee is an eccentric kind of show where there’s a lot of music but it doesn’t call for a ton of choreography. However, Choreography by Jose Reyes Teneza fits in nicely. There are only a few big group numbers including “Magic Foot” and “Pandemonium” but the choreography is creative and tight and the cast seems to be having a great time with it. Music Direction by TJ Lukacsina and Robin Trenner is impressive with great solo numbers and harmonic ensemble numbers that are on point and well-rehearsed. For being a fun, breezy show, Spelling Bee does, in fact, have some complex harmonies, but these were handled beautifully under the direction of Lukascsina and Trenner. Going along with Music Direction, the orchestra is worth mentioning, giving a commendable performance with Robin Trenner on Piano, Ellie Whittenberger on Synthesizer, David Booth on Reeds, Ina O’Ryan and Juliana Torres on Cello, and Mykel Allison on Drums. Taking on double duty as both a character in the production and Costume Designer, Stephen Foreman hit the nail on the head with these costumes. The costume design follows the original Broadway production’s scheme, for the most part, and his eye for detail is impressive. 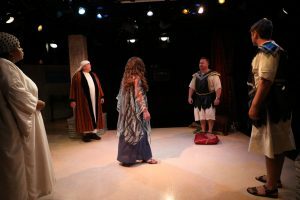 All of this actors seems comfortable in their wardrobe and the well though-out, meticulous costumes definitely add great value to this production. Being a first time director has its own set of challenges but being a first time director for a musical is something entirely different. However, Director Ryan Geiger does a fantastic job with this piece, understanding its humor and its poignancy in a very balanced production. His casting is superb and his vision is clear, seeing life through the eyes of some very anxious, over-achieving kids in competition with each other and trying to discover themselves in the process. 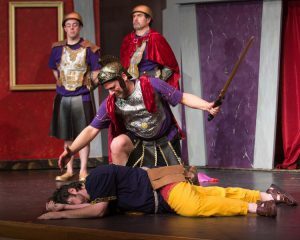 Kudos to Geiger for a job well done on his inaugural production as a director. Moving into the performance aspect of this piece, I have to say the ensemble, as a whole, is outstanding. Audience participation is the name of the game for this show and the ensemble works with the participants brilliantly. The seemingly random audience members who are asked to participate in the bee seem to have a great time with this ensemble and the ensemble assures each audience member is at ease during the performance. The chemistry is crystal clear, the harmonies are flawless, and the dancing is tight and concise. 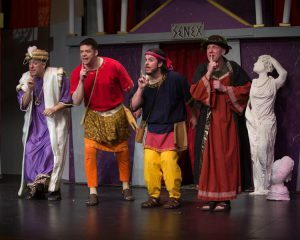 Every one of these actors is giving 100% and seem to be having a blast onstage, which, in turn, brightens the mood of the audience. Kirsti Dixon’s Macy Park is staunch and uptight, as the character calls and her number was upbeat and energetic. Though Dixon may have slight issues with the higher register of her number, “I Speak Six Languages,” her character is near perfect and she gives a strong, confident performance. Matt Scheer tackles the role of Mitch Mahoney, the rough and tough, ex-con Comfort Counselor who’s job it is to give the kids a hug and juice box when they’ve been eliminated. Scheer plays the role as more of an 80s metal-head throwback rather than the original gruff, leather jacket and chains wearing character. Still, this character works nicely and he’s comfortable in the part and has a strong, booming voice for his number “Prayer for the Comfort Counselor” that is a fitting finale for the first act. Logainne Schwartzangrubenierre, played by Libby Burgess, is an over-over-achiever pushed by parents who want what’s best for her, but might not see the burden it puts on her young, frail shoulders. Burgess tackles this role beautifully and her character is strong. The anxiousness and nervousness come out in her performance and she seems to really understand this poor kid. She’s comfortable on stage and has great chemistry with Zach Roth and Richard Greenslit, who play her two fathers. Charlie Roberts takes on the role of Chip Tolentino, the “alpha male” of the group and the winner of last year’s Spelling Bee. Roberts certainly looks the part in his clean cut Boy Scouts uniform but his portrayal of Tolentino falls a bit flat. Overall, he did a fine job with his performance, choreography, and songs, but I want his character to be a little more forceful and less delicate. His featured numbers “Pandemonium” and “Chip’s Lament” was performed nicely, but may have been a little too high for his register. However, he’s confident and comfortable onstage and gives a commendable performance. William Barfee, the obnoxious, know-it-all, and probably the keenest speller in the Bee, is played by Stephen Foreman who does a good job pulling this character together. His comedic timing is very good, though some of the jokes could be milked just a tad bit more as he tends to skim by them at times and, dare I say it, he could be just a bit more obnoxious as it’s what’s funny about this character. His number, “Magic Foot” is performed well and confidently and he seems comfortable and his look is spot on for this role. Kristen Zwobot as Olive Ostrovsky is definitely reaching in for her inner child for this role. She’s believable in the role and captures the awkwardness of a young girl with separated parents who may be too smart for her own good. She seems to get this character and doesn’t play her with pity but with compassion. Her numbers, “My Friend the Dictionary” and “The I Love You Song” (a trio with Rachel Weir and Matt Scheer), are touching and she performs them well with a strong, confident voice. Among the “child” characters, Zach Roth as Leaf Coneybear is definitely a highlight. His character is different from the other characters in that he’s really in it for the fun, not the competition. His innocence and naiveté makes you feel for him and root for him and he pulls the character off with ease. He’s comfortable in the role and his comedic timing is top-notch. He keeps his character interesting and makes a connection with the audience. Kudos to Roth for an admirable performance. Rachel Weir portrays Rona Lisa Peretti, one of the three adult characters in this show and one of the moderators of the Bee as well as a former winner. 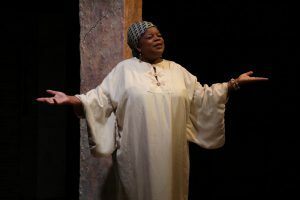 Weir is also a highlight in this production in this role as she embodies this character heart and soul. It isn’t hard to believe this woman is a adamant fan of spelling and of spelling bees and that, deep down, she does care for this kids and wants them to succeed because she had been in their shoes at one time. Weir has an absolutely beautiful voice that resonates throughout the auditorium in songs such as her “Favorite Moment” songs throughout the production explaining how the bee actually works. She acts this character flawlessly and has a strong confident presence making her a joy to watch. Richard Greenslit as Douglas Panch is the standout in this production of The 25th Annual Putnam County Spelling Bee. As Douglas Panch, Greenslit has impeccable comedic timing and doesn’t take his character too seriously making for a phenomenal performance. He had me at stitches with his delivery of some of the definitions and sentences for some of the words in the bee. His chemistry with his cast mates is excellent and he seems to have a grasp on the purpose of this character which makes him quite believable in this role. He’s comfortable with a very strong stage presence and gives a performance that knocks it out of the park. 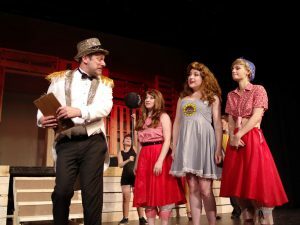 Final thought… The 25th Annual Putnam County Spelling Bee at Heritage Players is an entertaining and funny show to which mostly everyone can relate. We’ve all had that crazy time in life where changes were happening and things we don’t find so important today were life or death situations. It’s easy to relate to these characters and see a little of ourselves in each of them. 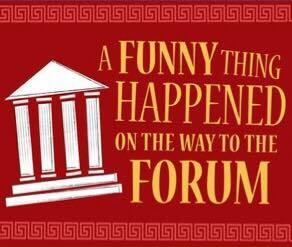 If you want a fun show to check out, get your tickets now! This is what I thought of Heritage Players production of The 25th Annual Putnam County Spelling Bee. What did you think? Please feel free to leave a comment! The 25th Annual Putnam County Spelling Bee will play through November 20 at The Heritage Players, Rice Auditorium at Spring Grove Hospital Center, 55 Wade Avenue, Catonsville, MD. For Tickets, email heritageplayerslive@gmail.com or purchase them online.